The time during which a comet is under observation. For periodic comets which have more than one appearance, the term apparition is often used with the year of perihelion passage, such "the 1910 apparition of Comet Halley." The term probably is derived from the ghostly appearance of bright naked-eye comets. One AU, or astronomical unit, is the distance from the Sun to the Earth, equivalent to 93 million miles or 148 million kilometers. It makes a convenient unit of measure within the Solar System. When we say, for example, that comet NEAT is 10 AU from the Sun, you can see right away that it is ten times farther out than we are. Saying that NEAT is about 1,480,000,000 kms out carries no such obvious information and requires us to absorb too many digits. The Moon is 0.003AU from Earth or 380,000 kms. A "trick of the trade" is to use the side of the eye when observing rather than look directly at the astronomical object since the side of the eye is much more sensitive to faint light. (See dark adaptation). The most effective method for observing faint astronomical objects is when you combine these two techniques with movement. i.e. wiggle a pair of binoculars. Are solar system objects traveling around the sun usually in highly elliptical orbits. They are not atmospheric phenomena as is the usual public misconception (see meteor). Comets are made of water ice, silicate dust and other gases. They are typically 1-10kms in diameter and developed beyond Neptune in the cold depths of the solar system. As a comet approaches the sun, ice sublimates to form a large coma surrounding the nucleus. The solar wind sweeps away the ionized gases to form an ion tail which always points away from the sun. Dust particles released from the nucleus form the dust tail which sweeps behind the comet along its orbit. Comets are designated by year of discovery followed by half month of discovery ('I' is not included) followed by numerical order of discovery followed by name of discoverer. e.g. 2001 Q4 was the 4th comet discovered during the second half of August 2001. An essential requirement for observing astronomical objects. Dark Adaptation requires the observer to avoid direct light for at least 5 minutes prior to observing (preferably 20 minutes). The eye in total darkness will progressively develop a light sensitive pigment called Rhodopsin (a derivative of Vitamin A) which enables greater peripheral vision at night. Persons lacking in Vitamin A will suffer from "night blindness". To maintain dark adaptation during the night, avoid white light. A torch wrapped in red cellophane is an essential observing tool. DC is an indicator of how much the surface brightness of the coma increases toward the center of the coma. In general, DC=0 indicates totally diffuse and DC=9 means "stellar." As the DC increases, the coma size usually decreases and becomes more sharply defined. 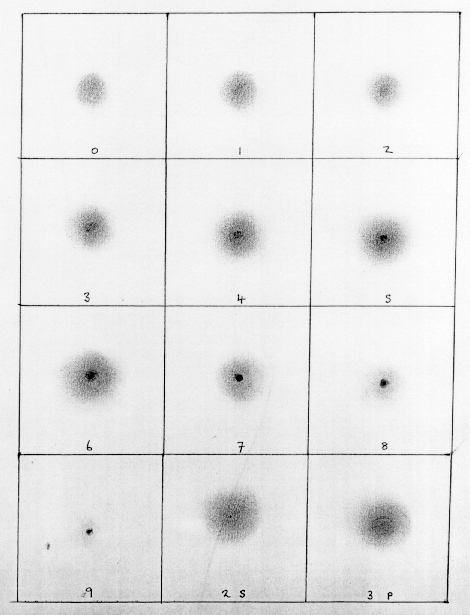 A totally diffuse comet, with no brightening toward the center, is rated DC=0. With DC=3-5, there is a distinct brightening. By DC=7 you have a steep overall gradient and by DC=8 the coma is very small, dense and intense with fairly well defined boundaries. With DC=9 the comet looks like a soft star or a planet in bad seeing. In general the DC will increase as a comet approaches the Sun and decrease as it recedes from the Sun. Elong = objects elongation from the Sun in degrees. If less than 30 degrees, object is considered too difficult to observe. Phase = Sun-object-Earth angle in degrees. Greatest length of a comet's tail usually occurs around a phase angle of 90 degrees. The brightness of stars and other celestial objects is described in terms of magnitude. The magnitude scale was created by the Greek astronomer Hipparchos sometime near 180 BC. He labeled the brightest stars he could see as magnitude 1, the next brightest as magnitude 2, down to the dimmest at magnitude 6. The definitions were arbitrary. When people started using telescopes, the scale was extended to dimmer stars, meaning magnitudes greater than 6. Also, decimals were added to allow one to distinguish stars of roughly the same brightness; for example, Polaris, the North Star, is of magnitude 2.02. Very bright objects can even have zero or negative magnitudes; for example, Sirius, the brightest star in the sky, is of magnitude -1.58; the planet Jupiter is about -2; Venus -4; the full moon -11; the Sun -26. Or "Shooting Star" is a small particle, usually cometary debris, striking the Earth's atmosphere causing it to glow temporarily. The comet is in the midnight sky on the opposite side of the Earth from the Sun. A perfect opposition, which almost never happens, has the comet 180 degrees away from the Sun. An object orbiting the sun is said to be at Perihelion when it is closest to the sun. The comet is near the Sun in the sky. Usually, this means that the comet will not be observable from Earth.